What an amazing weekend up at the lake with Steve and his wife Kathy. They were warm, welcoming, and the view from their house is absolutely stunning! You feel like part of the family! Steve in an excellent instructor with attention to detail, and makes sure you are ready for your check-ride. If there was another rating to get I would definitely go back! Thanks Steve and Kathy! I spent last weekend training for my seaplane rating with Steve at Grand Seaplanes. It was an awesome experience! Steve is a great instructor, the Lake LA-4-200 Buccaneer is super fun to fly, and the setup he has on Grand Lake provides a fantastic learning environment. I learned everything needed to pass the rating in two days, all within a few miles of Steve's cabin. The DPE met us at Grove airport on Sunday morning, and by 10am I had my new rating. I also took advantage of the room and board option at Steve's cabin. He and his wife Kathy were great to spend time with, and Kathy's cooking was excellent! I am so glad I chose Grand Seaplanes for this training, and recommend it very highly. YOLO, so get that seaplane rating before it's too late! I had a great time earning my SES at Grand Seaplanes. 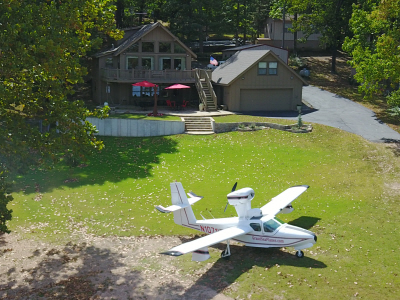 Professional flight instruction in a fun environment. I stayed at the lake house and felt like part of the family. After flight training it was nice being able to unwind at the lake. I would stop by again just for the food. Thank you! Copyright © 2018 Grand Seaplanes All Rights Reserved.